One full week removed from Josh Brown’s release from the team, the Giants have returned to the practice field following their bye week to prepare for the Philadelphia Eagles who they’ll host at MetLife on Sunday afternoon. After the Eagles loss in overtime to the Cowboys this past Sunday the Giants now find themselves in a tie with the Eagles for second place with both clubs sitting at 4-3. The Redskins bring up the rear in the division with a 4-3 and 1 record, though they have an edge on the Giants with their victory over them in week three. There are several keys for the Giants to continue their winning streak and put some separation between them and the Eagles. Below are three keys to a Giants victory. The Giants have had a virtually invisible running game this season, in fact they are last in the league averaging 70 rushing yards a game. The Giants have been missing a dependable runner in the backfield all season long. Rashad Jennings, who missed a few games with a thumb injury, has hardly been an effective runner when he’s been on the field. Part of his problem may be that the Giants have resorted yet again to the running back by committee which has prevented him from getting enough touches and getting into a rhythm. Regardless, the Giants complete lack of a threat when it comes to their running game has forced Eli Manning to heavily rely on his receivers and the passing attack. The Giants need to shake things up a bit and perhaps allow Jennings or one of the other running backs to get 20-to-25 touches all by themselves. Allow a single runner to have their hand at creating a viable running game. The offense needs the rushing attack to begin to trend in a positive direction and improve so that their offense does not continue to be as predictable as it’s been through the first seven games. The rookie quarterback got off to a great start leading the Eagles to a 3-0 record but in the last 4 games the Eagles have fallen back to earth going 1-3. Wentz had one of his worst games against the Redskins in a week 5 loss where he was under pressure constantly, going 11-for-22 for 179 yards with no touchdowns. The Redskins actually sacked him 5 times on the day. The Giants need to replicate a version of that game and take Wentz out of the game from the outset and prevent their offense from getting into any kind of rhythm. Last week, for the first time, the Giants much talked about defensive line showed up in a big way, accruing three sacks in their win against the Los Angeles Rams. The Giants revamped defensive line put forth a strong effort to help in getting a much needed victory. 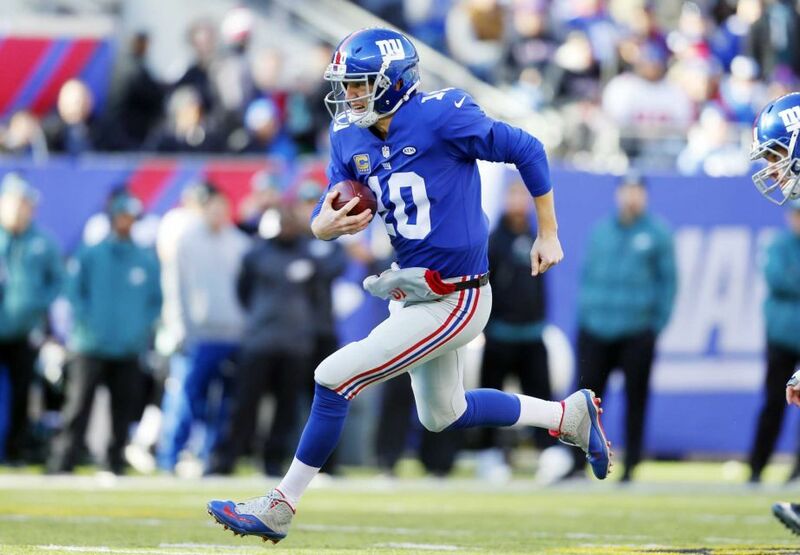 They will need to deliver in similar fashion on Sunday because the Giants cannot rely on their offense to outscore their opponents on any given Sunday. The Giants secondary needs to focus on keeping the reins on Jordan Matthews and Darren Sproles. The twosome’s 58 receptions account for more than one third of all catches made by Eagles receivers. Both Sproles and Matthews also have the two longest pass plays on the season, 73 and 54 yards respectively. Though the Giants secondary has been decimated by injuries all season long, they’ve had two players who’ve been there week in and week out delivering performances that have helped the team win close games. Landon Collins is coming off a career game with 2 interceptions, 8 tackles, and 1 touchdown where he appeared to ascend into the bright lights of NFL stardom. The other player in the secondary who has been the picture of consistency is Janoris Jenkins, who’s frequently been matched up against opposing teams best receivers. Expect both of them to come ready to play and for Dominique Rodgers-Cromartie to be another factor in keeping Eagles receivers at bay.